All are welcome to join us at Woodside for Prosphora baking! Prosphora (Greek for "offering") is bread prepared for use in the Divine Liturgy. A portion of it, known as the lamb is cut out during the Proskomedia service which is consecrated during the Divine Liturgy to be the Eucharist, while the rest is cut up for the antidoron, the blessed bread distributed at the end of the liturgy. 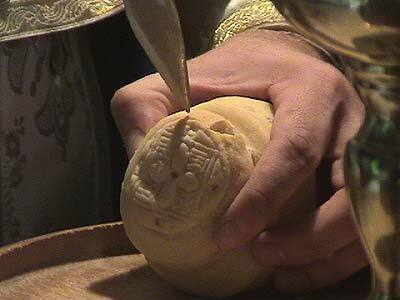 During its preparation, prosphora is stamped with an image usually including IC XC NIKA ("Jesus Christ conquers"), which is maintained during baking and then serves as a guide for cutting out the lamb during the Proskomedia. Prosphora baking days vary. Check the Church calendar or contact Fr. John at the church office for more information.